Today was suppose to be a DIY post, but I couldn't think of a DIY to do at all! So I thought I'd do santa nails as thats kinda a DIY right? As its National Christmas Jumper Day, I wanted my nails to sort of match my jumper, its a bit of a Rudolph/ Santa combo! I thought I'd do a bit of an accent nail using O.P.I Golden Eye polish and Orly Hair Band as my dose of sparkle, but stick to the traditional dark red in the form of Barry M Red Wine Nail Paint for the rest of my nails bar the thumb. This is where santa comes along, Ive used Essie Tea and Crumpets, then Barry M White, Red Wine and Black. I also picked up a fantastic little nail art kit from Poundland and they've come in very handy when doing the little details. 1. Put down one layer of Essie Tea and Crumpets as a base. 2. At the top of the nail by the cuticle, paint a straight line of Red Wine, then at the bottom of the nail, paint a curved line in White, I used two coats. 3. Once the Red Wine line has dried, put quite large dots along the bottom of the Red Wine line. Apply two coats of this. 4. Once the curved white line has dried, draw in the middle a little smile in the black nail paint. Don't forget santa's eyes too, by dotting them on above his beard! 5. Finally apply a topcoat once everything has dried and thats you done! 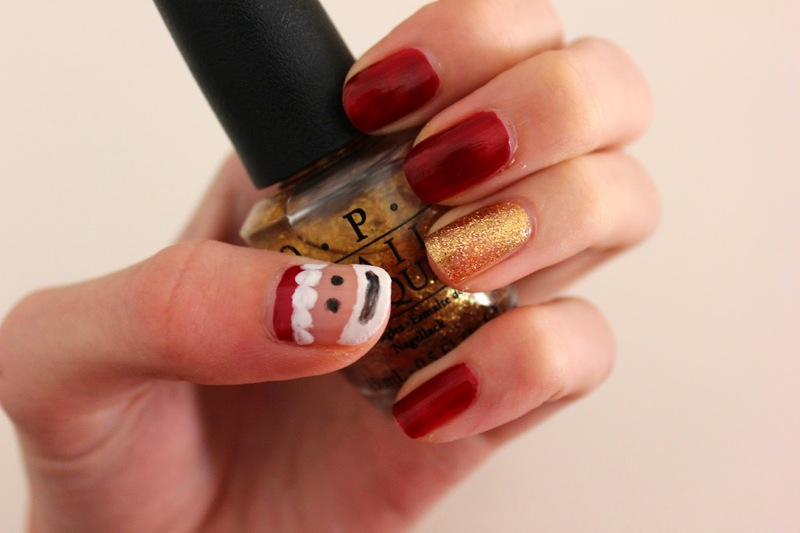 Now you're all set for christmas with your festive santa nails! Sorry this isn't the DIY post it was suppose to be too, I was a little stumped! I hope you've enjoyed my little santa though instead! 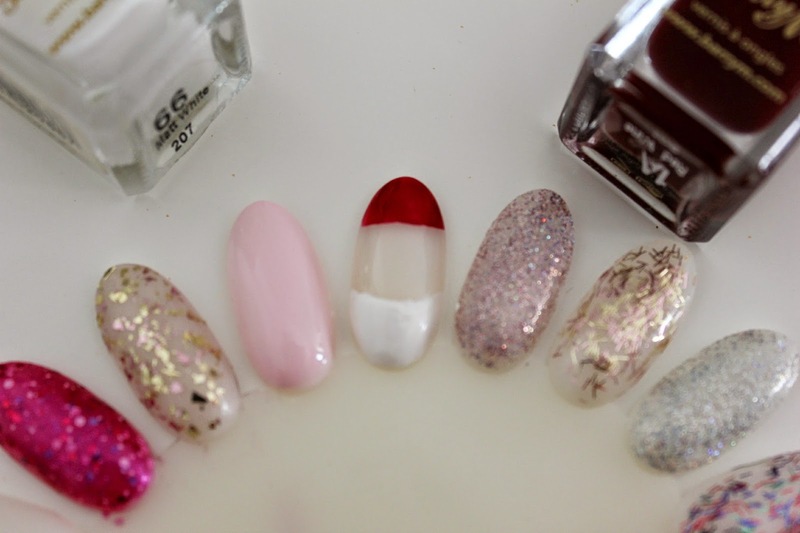 That santa is the best nail i've seen this season! Great chatting with you! 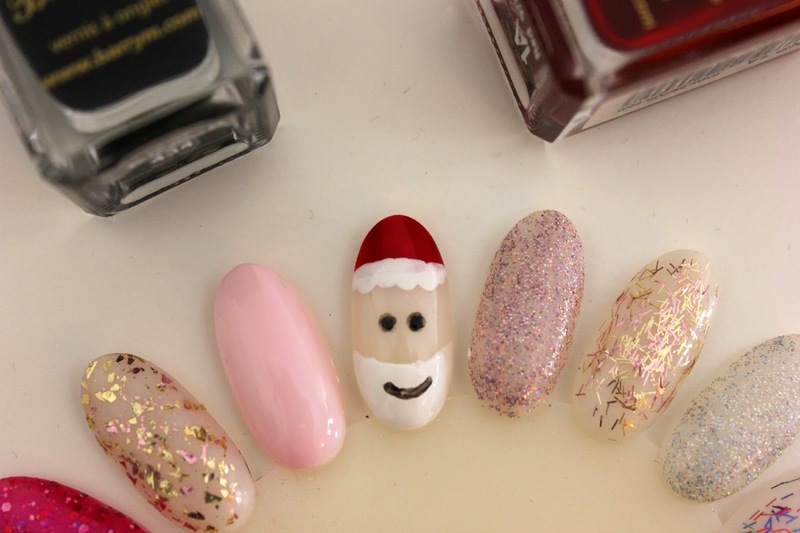 I love the santa nail - so cute. What's in my New Year Makeup Bag? It's Christmas Time with Barry M! Christmas Gift Guide: Stocking Stuffers!